I have not been nearly as productive with my sewing this week as I was last week. However, I did make a few little projects for baby boy. I showed you some last week, and thought I might make this a friday feature until he makes his debut (due date is April 26). 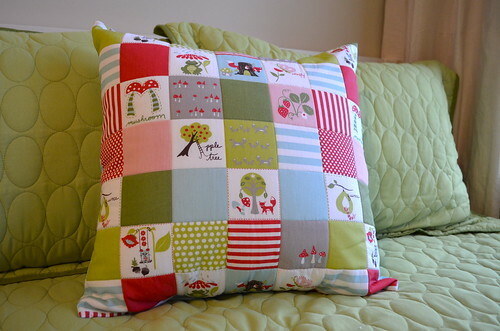 I made a pillow using the cheater print from Fox Hollow to go on the bed in his nursery. All I did was add some batting and quilt in the ditch of the cheater print. Pretty easy! I still want to make a fox shaped pillow or something else fun for this bed. 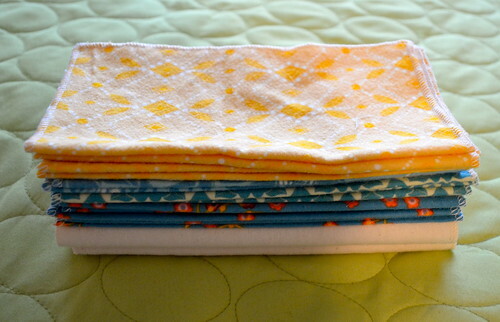 Next up is a stack of flannel baby wipes (for the cloth diaper thing) made from various Anna Maria Horner flannels. I used my serger to go around the edges. Easy peasy, just one layer at 8" square. I need a few more, I think, but those are pretty boring to make so I had to break it into two sessions! My biggest accomplishment this week was the fitted crib sheet. I used the Prudent Baby tutorial for a serged sheet. It actually was my quickest finish of the week and ended up being very easy. It is funny sometimes how certain tasks seem so daunting and end up being no biggie at all! I made the crib sized pillowcase using the hot dog method a few weeks ago. I am not going to bother with bumpers. I think they were in use for about a week with my other two boys, so it kind of seems like a wasted effort. I love this Friday feature. The nursery is lookin wonderful! You are looking very organised! Maureen Cracknell Handmade has some fox appliqued cushions. Have you seen her blog? 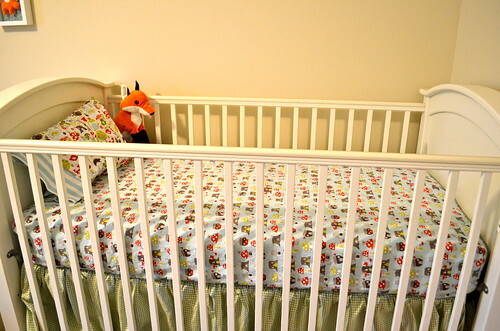 I sewed the prudent baby crib sheet as a gift for my new niece last fall and I was nervous about it too. It was so easy. It is funny how you worry so much about a project that turns out to be no big deal. I love the woodland theme in your nursery!!! These are wonderful. I so agree with you on daunting projects. is not legitimate anymore”, however it’s almost certainly up and running once again.